The Christie Mirage 304K with its 30000 ANSI Lumen offers high brightness. 30000 ANSI Lumen will make vibrant and vivid projections at large conferences, fairs or at outdoor events like cinema or soccer. The Christie Mirage 304K thus plays in the 'event-league' and is also designed for continuous operation in theaters, churches and at expos. The contrast of the Christie Mirage 304K comes in at a very high 2000:1. The human eye can only recognize contrast ratios of 800:1 maximum. 2000:1 is thus great value, which will give you great dynamic images and colours. The projector works on Texas Instruments' DLP technology. The light is reflected by thousands of micro-mirrors (one mirror for each pixel). DLP technology stands for high contrast ratios and great luminosity, as well as a compact design. 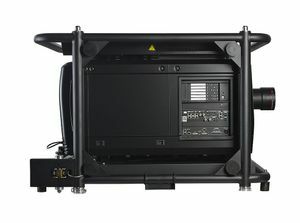 The Christie Mirage 304K supports the Real Full HD 3D format (Blu-ray 3D format). The Full HD 3D format is the only 3D format without any quality loss. Both perspectives are merged in a full frame resolution of 1920x2205 pixels and transmitted through a HDMI v.1.4 connection from Blu-ray player to projector. Up until HDMI v.1.3 it was not possible to display subframes at such a high resolution. That's why Real Full HD 3D is not compatible with HDMI 1.3 cables . There are a few exceptions such as the Playstation 3. The projector has also an optical lens shift. 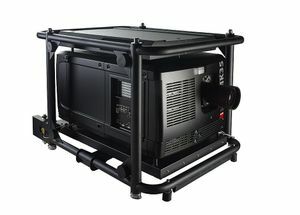 The Christie Mirage 304K, as most high - end of projectors, is offered without a lens. We can provide any interchangeable lens for this model. Just contact us, stating your requirements. The projector uses interchangeable lenses, giving you extreme flexibility to equip the projector with different optional lenses. It makes no difference whether you have to project at 2 meters or 50 meters distance, there is always a suitable lens for your requirements. Please ask us directly, stating your requirements. The lamp lifetime is 1500 hours. This is a very high value, which will guarantee years of vivid projections, and vey low follow-up costs for you. The current lamp running time is 0 hours. At an average of 1.5h daily operation, a new lamp will run 3 years. We offer projectors in different conditions. The Christie Mirage 304K on sale is in a 'NEW' condition. That means, it is an unused product with a new lamp. The projector may be packed neutrally, as we receive devices directly from the manufacturers in large quantities.